The LHC is back in business! Today, CERN's Large Hadron Collider (LHC) started delivering physics data for the first time in 27 months. After an almost two year shutdown and several months re-commissioning, the LHC is now providing collisions to all of its experiments at the unprecedented energy of 13 TeV, almost double the collision energy of its first run. This marks the start of season 2 at the LHC, opening the way to new discoveries. The LHC will now run round the clock for the next three years. Read the full CERN press release: "LHC experiments are back in business at a new record energy"
Stable beams declared! 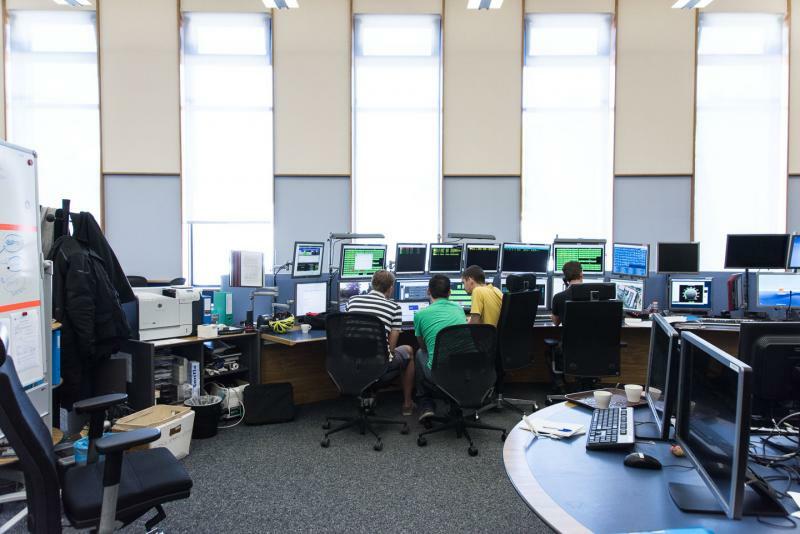 A cheer and a round of applause from the team in the CERN Control Centre. CERN Director-General Rolf Heuer said: "Congratulations to everybody, here and outside! We should remember this was two years of teamwork. A fantasic achievement. I am touched. I hope you are also touched. Thanks to everybody. And now time for new physics! Great work!" LHCb and ALICE now have collisions at 13 TeV! Awaiting the declaration of "stable beams" from the LHC team. This will be the signal for the experiments to start taking data at the new energy frontier. 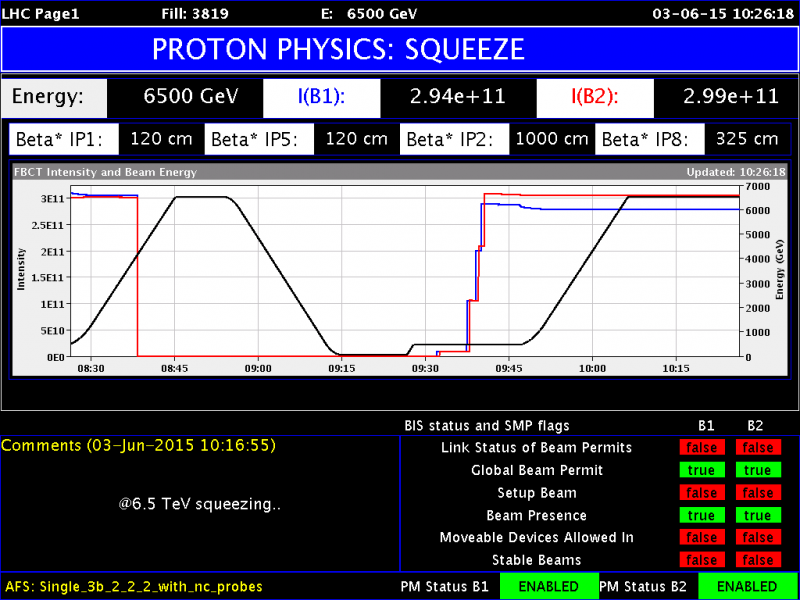 And we have collisions at #13TeV! Now we wait for stable beams. A huge cheer and round of applause in #ATLAS Control Room for first #13TeV collisions! Congratulations to the LHC @CERN for this milestone! Beams now colliding at 13 TeV inside the ATLAS and CMS detectors! The LHC Operations team is preparing for first collisions at 13 TeV - aligning the beams at the four interaction points around the LHC ring. Beam squeeze successful! Time to adjust the beam orbits in preparation for collisions at 13 teraelectronvolts (TeV). The next step is to adjust the beams. With the beams at maximal energy, the Operations team makes final checks and refinements. The beam orbit is stabilized to ensure that the beams interact optimally to give the most physics data when they are brought into collision. Now preparing to "squeeze" the beam; to focus it down to increase the density of particles in each bunch of protons, in order to maximise the probability of collisions. The animation below shows how the beam in the LHC is formed of many bunches of particles (up to 2808), each measuring a few centimetres long and a millimetre wide. Their width is smaller than the size of Spain on a 1 Euro coin. However, the bunch size is not constant around the ring. Each bunch, as it circulates around the LHC, gets squeezed and expanded. It gets squeezed by magnets as much as possible around the interaction points to increase the probability of a collision. As they approach the collision points, they are squeezed to about 16 micrometres (a human hair is about 50 micrometres thick) to allow for a greater chance of collisions. The beams have reached their top energy of 6.5 TeV. This part of the process is known as "Flat top". The beams will continue to circulate at this energy. You may notice that the blue and red lines on LHC page 1, which represent the number of protons in beams one and two respectively, start to decrease as protons are shaved off the beams by the collimators. The next step is "Squeeze" the beam - focus it down to maximise the density of particles in each bunch, ready for collisions. At point 4 on the Large Hadron Collider (LHC) sit "Beam Synchrotron-Radiation Telescopes" (BSRT) – one per beam. These cameras record the synchrotron radiation that is naturally emitted when charged particles – in this case, protons – change direction as they travel around the bends in the LHC’s 27-kilometre ring. 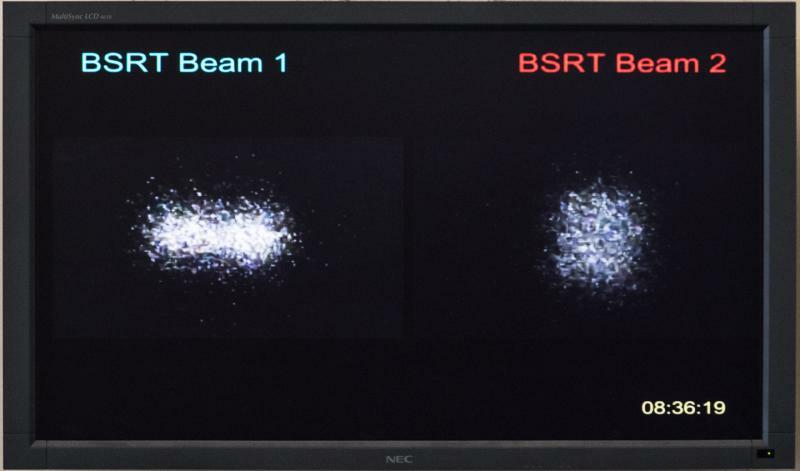 The picture below shows the output screen from these trackers – Beam one on the left, Beam two on the right. 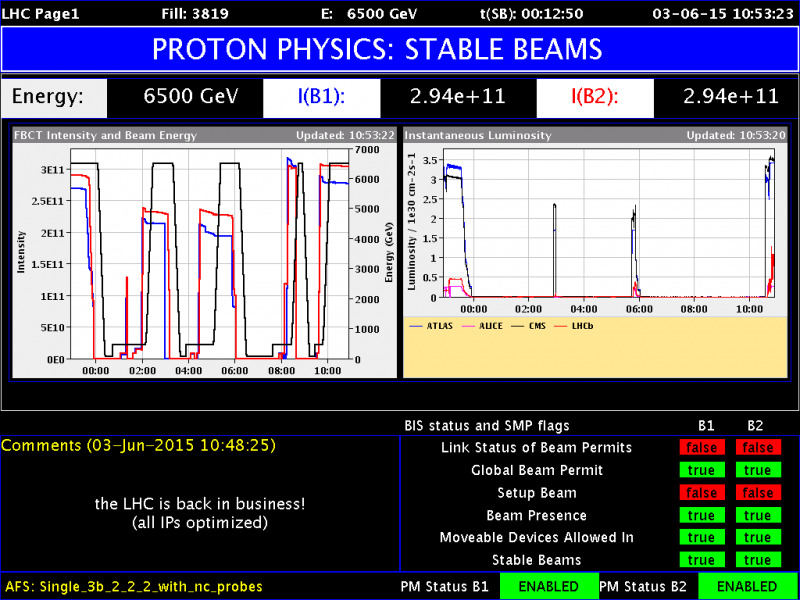 When the LHC operators see the white dots on the screen, they know the beam is circulating correctly past point 4. The LHC experiments ATLAS, ALICE, CMS and LHCb are on standby, ready to receive beams in their detectors. Find out how they prepared their detectors for collisions at 13 teraelectronvolts (TeV): "Major work to ready the LHC experiments for Run 2"